Some people would rather endure an electric shock than be alone with their thoughts for a few minutes. Here’s how to stay focused in silence and take back control of your mind. This summer, a widely publicized report provided a stark reminder about the state of the modern mind. “Men would rather receive an electric shock than think,” declared the headlines. While today’s news is often sensationalized, in this case, the stories were sadly accurate. The report, published in the July issue of the journal Science, outlined a series of 11 studies in which volunteers were asked to sit alone with their thoughts for between 6 and 15 minutes, and the results were fascinating. The early experiments showed that people age 18 to 77, from various demographics, found it uncomfortable and hard to concentrate when sitting in a bare room alone with their thoughts. The results held up when the volunteers were asked to sit in their homes and think, though they were able to focus more easily when allowed to read or listen to music. Finally, when seated in a room with nothing to do but press a button that they knew would produce an electric shock, 12 out of 18 men and six out of 24 women chose to shock themselves rather than weather the tumultuous terrain of their own minds. Many administered the shock more than one time over the course of 15 minutes. As someone who revels in solitary quiet time, I struggle to fathom the inability to embrace silence. Can time spent without distraction, simply sitting in quiet, really be that bad? In other words, controlling our thoughts is hard, and indulging in distraction, one of the few unlimited resources of today’s world, is easy. But just because our minds have a tendency to gravitate to the external—the e-mails, music, entertainment, and social interactions that fill our days—does not mean we should let these factors dictate how we live. In addition to mitigating our ability to sit with our thoughts, a life of distraction takes a toll, potentially affecting our cognitive abilities as well as our relationships and sense of self. Hyper-connectivity can also affect our capacity for patience and need for immediate gratification. Carving out time for quiet—a precious commodity—is something that can often get bumped down our to-do list but is highly worthwhile. There are numerous ways we can quiet the mind, learn how to focus, and find stillness, and there are just as many reasons to do so. Meditation is a powerful tool to harness self-awareness. “Meditation remakes our relationship to everything. It helps us experience joy and pleasure more fully; experience pain with presence and compassion instead of anger and fear; and experience neutral times with more connection and awareness,” says Sharon Salzberg, a meditation teacher, author, and co-founder of the Insight Meditation Society in Barre, Massachusetts. Instead of trying to escape or distract ourselves, meditation teaches us to simply be here now, with all our thoughts, feelings, and emotions. In scientific studies, meditation has been found to be highly effective for chronic health conditions such as stress, insomnia, and anxiety. When our minds are engaged in contemplative disciplines, we can enact healthy patterns that can bring us into the present moment and stave off depression. The concentration practice of loving-kindness, also called metta meditation, has been found to foster test subjects’ capacity forcompassion. This powerful heart-opener has also been shown to increasefeelings of connection. Gratitude and positivity, highlighted in this practice, can have a profound impact on one’s mental state. As opposed to breath meditation or mindfulness meditation, loving-kindness allows one to focus one’s energy on, first, the self, then those we love, then those we are neutral toward, those who might be challenging, and, ultimately, everyone in the world. 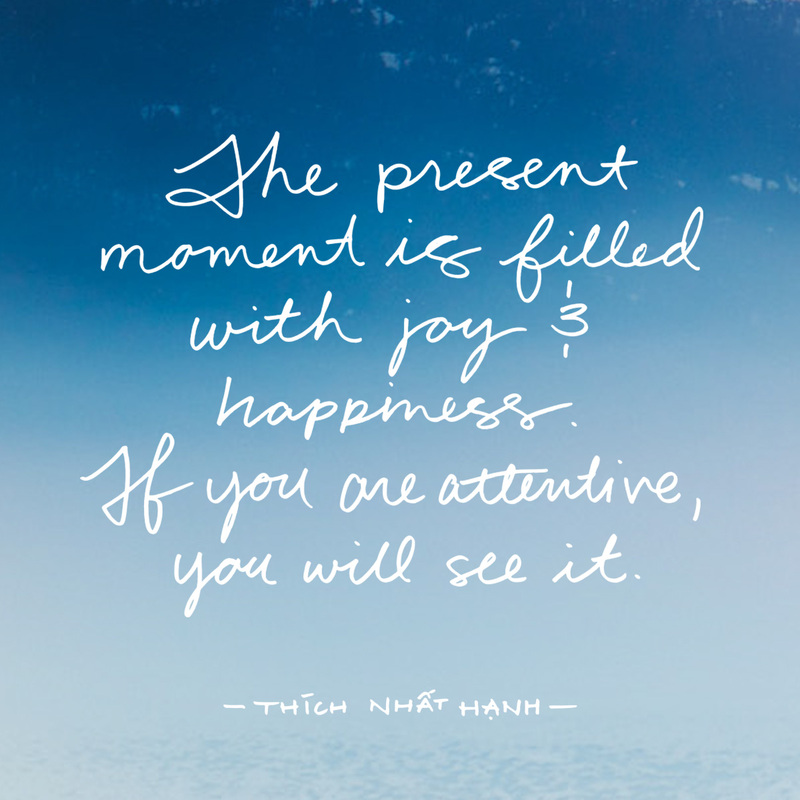 This focused intention can be uplifting and offers a beneficial practice for those who might be challenged by mindfulness meditation; instead of asking us to concentrate our focus, it asks that we simply allow our focus to be on awareness—of ourselves and our surroundings. In order to start a meditation practice, the key is to be open. You can set goals but keep them in the realm of possibility. You don’t have to be shrouded in orange prayer shawls, levitating toward the Himalayas in the first week. “Many people will start with settling their attention on feeling the natural breath wherever it is strongest—nostrils, chest, or abdomen. Don’t be dismayed if after being aware of only one breath your mind wanders off. That’s very common. Once you realize you have become distracted, see if you can gently let go and, without judgment, bring your attention back to the breath,” says Salzberg. Here are a few tips that can help us find comfort in the quiet and generate a sustainable meditation practice. Focus on the breath. This simple three-minute practice from Kozlowski allows us to be aware and present with the breath. Take a deep breath, filling your belly and exhaling gently. Continue this slow breathing to give yourself space to center. Focus on your breath until it becomes slow and rhythmic. Allow your mind to shift to attend to sounds around you. Should you become distracted, simply notice, acknowledge the distraction, and return to breath and then to sound. Meditating on sound is something that can be done in almost every environment, is simple, and provides an initial focus of stimulation that leads us to eventually appreciate not only the sound but also the spaces between sound—the peace of quiet. Sit comfortably. “Don’t feel like you have to sit in a pretzel-like posture,” Salzberg says. You can sit on a cushion or chair, or kneel. Some like to use a meditation bench to provide a solid seat. Remember to keep your spine long to allow yourself to be alert and to support your back. Share the love. Metta can have a strong impact on your sense of belonging, relaxation, and overall wellness, and metta meditation is a powerful way to align yourself with a sense of benevolent compassion and universality. Here is a simple offering of loving-kindness to the world, to those with whom you might struggle, and to yourself. You can say them quietly or silently, in your mind. Again, find a comfortable posture, close your eyes, or have your eyes softly focused downward, and meditate on the following phrases. May you feel safe and protected. May you feel contented and pleased. May your body support you with strength. May your life unfold smoothly and with ease. The act of sitting and creating ritual can provide a structure that allows us to cultivate quiet and inner calm. Whatever practice you’re drawn to, the quiet it generates can fill the well, providing a foundation of grounded energy that allows us to show up for life with strength and presence. No electric shocks needed.